SHANGHAI -- Many people who received an overabundance of gifts for Spring Festival, or prepared too many presents, are rushing to shift their goods, often online. 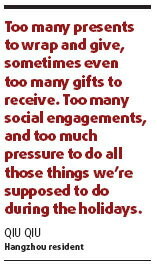 "The holidays have long been viewed, from the perspective of money and goods, as a time of excess. It always seems like too much every year," said Shen Qing, who received a dozen boxes of fruit as gifts. "I don't think my family can finish them all although we are eating as much as we can. So I have to sell them online and at a favorable price before they go bad," she said. "Superb cuisine and a wide selection of drinks to ring in the New Year, extra cookies or cakes at the family party ... most people just give up on their good intentions to save money. There's lots of goods left over," said Susan Wang, who is selling bottles of wine and two large bags of cookies online. "This is a very common practice, although holiday spending exacerbates financial worries for many families," she added. Online shopping websites, such as eBay and Taobao, are offering thousands of "resold goods", including food, beverages, cigarettes and small appliances, at low cost. Meanwhile, some people are bartering instead of buying and selling, in the hope of picking up something they want. In addition, many of those who use these websites have posted messages critical of themselves for being weak and adding to the conspicuous consumption and waste of the holiday. "Too many presents to wrap and give, sometimes even too many gifts to receive. Too many social engagements, and too much pressure to do all those things we're supposed to do during the holidays," Qiu Qiu, a resident from Hangzhou, Zhejiang province, said. "Excepting the goods for family use, I have to spend at least 10,000 yuan ($1,463) on gifts for friends, although I know some recipients don't need the gifts," she said. Although prices are favorable, the consumer protection department advises consumers to be aware of the products' shelf lives, especially foods and beverages, and to ask for a warranty card and receipt when buying electrical household appliances.